The Elswick Ordnance Co. was founded by Sir William Armstrong in the mid 1850's to supply arms (meaning heavy guns) to the British Admiralty. The factory was located in Newcastle upon Tyne, where Armstrong had already started a thriving hydraulic crane business, in 1847. Originally a lawyer, Sir William changed careers in order to satisfy his urge to dabble in the mechanical arts. He couldn't have been more successful. 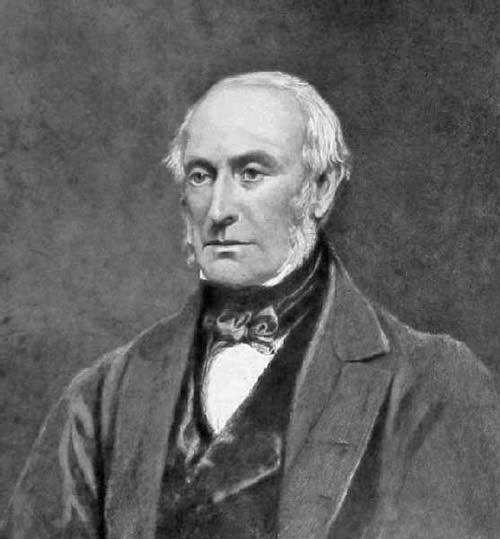 He originally designed a 5 pounder breech loading gun, in response to reading about British difficulties managing guns during the Crimean War. The gun was built with a central rifled tube, originally in wrought iron, with successive tubes of wrought iron shrunk upon the first and built up to make a very sturdy gun. A government committee was impressed during trials, but wanted bigger guns. Armstrong built an 18 pounder to the same design, and during trials proved superior to conventional guns. Being a patriot, Armstrong donated the design to the British Government. Armstrong formed the Elswick Ordnance Company to build this gun and others. 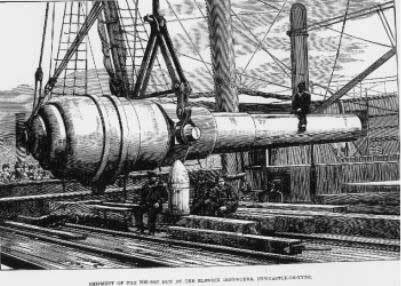 Dissatisfaction with the original breech design cooled the British Government towards Armstrong guns, but by 1880 Armstrong became a major supplier. The location of the factory at Elswick (Newcastle) fit in with his other manufacturing interests, and eventually grew and absorbed and built shipyards, steel mills and of course, the big guns. 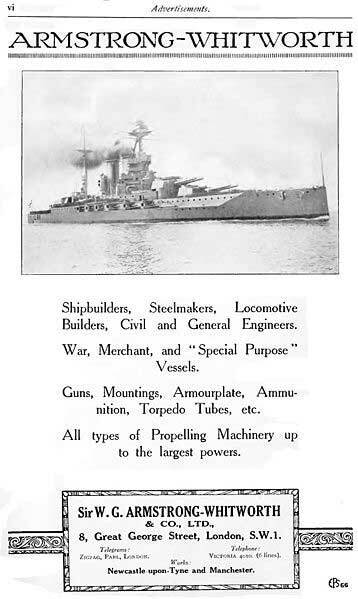 At the time, Armstrong's company was the only one in the world that could build a warship from scratch and equip it with everything, including the guns. 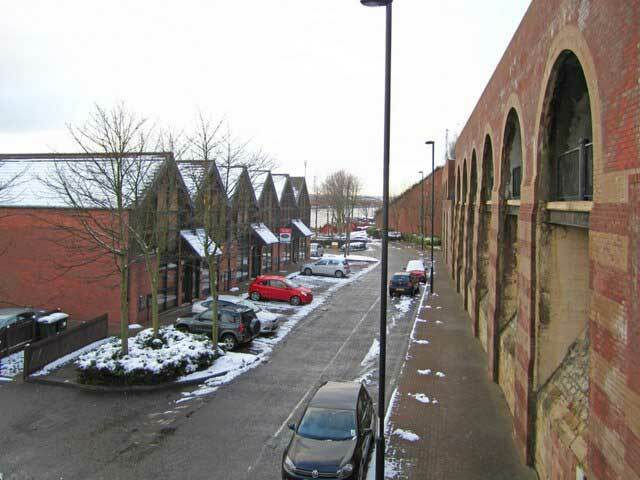 The Elswick works did it all, even more so than at Woolwich. 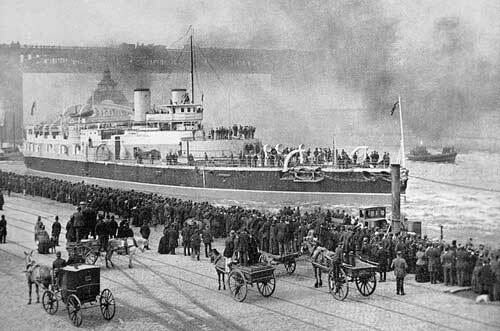 Stretched along the banks of the Tyne, they made everything with the exception of gunpowder and marine engines. It was a huge industrial powerhouse and included a new shipyard just for warships, and another shipyard to the east of Newcastle, the Low Walker Shipyard, for commercial ships. Also the Armstrong works sold guns and ships to other countries, including the Japanese, who defeated the Russians in 1905 using Armstrong guns on Armstrong ships. Newcastle had been a coal mining and iron making center since forever. 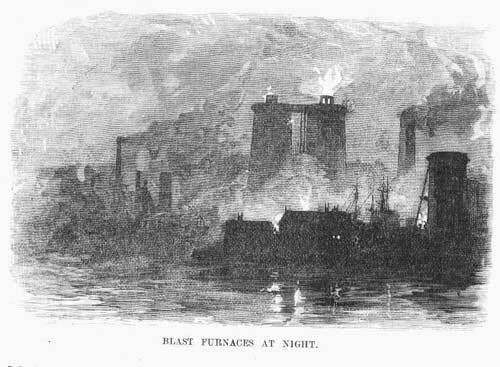 In the 1840's, blast furnaces starting popping up all over Newcastle. Locomotives are manufactured there, and Armstrong took that on too. The first rolled armor for ships was made there by William Smith and Co. The first oil tanker was built at Walkers shipyard, another Armstrong subsidiary, while Armstrong's Naval Yard turned out battleships. The never ending hum of machinery as gun after gun was built and shipped off, or installed on another battle cruiser. By 1900, there were 3 large blast furnaces at Elswick, at least 8 steel furnaces, and a huge brass foundry. The steel works covered 12 acres by itself, producing 1500 tons of steel ingots a week. The works has spread out to Scotswood, and added another 30 acres to the plant. All the buildings are connected by railway and overhead cranes, served by huge coal and gas fired boilers and engines. The smoke, heat and din must have been extraordinary. 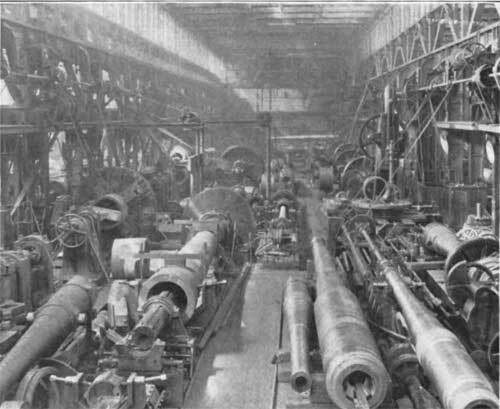 The Elswick works turned out about 6,500 tons of guns and mountings per year. 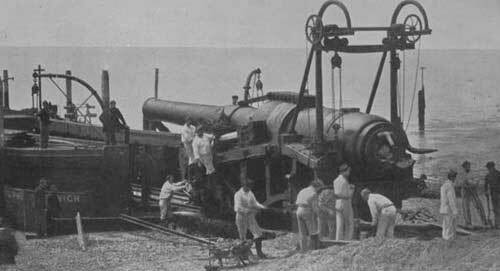 A 10 inch gun took about a year to make, and the 100 ton gun took 18 months. 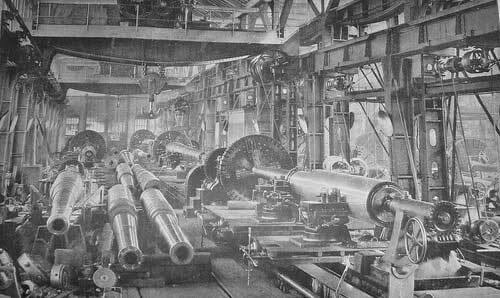 The lathes of the gun building department ranged from the most delicate to the largest ever made. Some Brits have been uneasy at the fact that Armstrong sold war material to other countries, even possible future rivals, but is slightly releived to learn that the British Government could, and has, stepped in to appropriate warships when necessary, to the dismay of the customer country. Armstrong merges with Charles Mitchell's shipbuilding firm the Low Walker Shipyard. 1882, now known as Armstrong, Mitchell and Co. Forced merger with Vickers 1928 to become Vickers Armstrong Ltd.